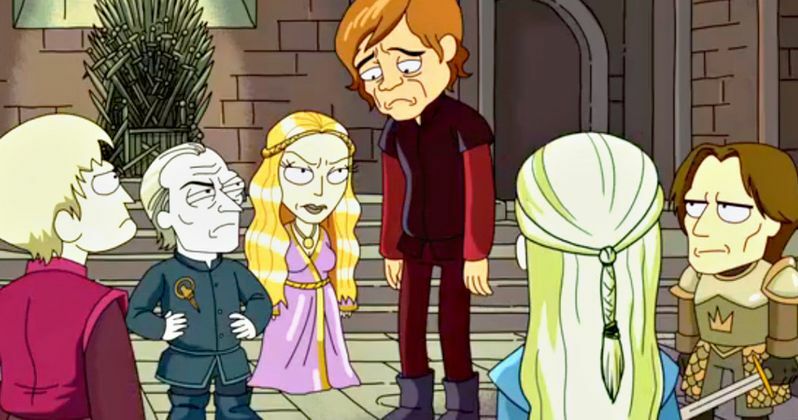 Adult Swim's hit animated series Rick and Morty delivered Game of Thrones a savage burn during a post-credits message to the massively popular HBO show, which is arguably the biggest series on the planet. Game of Thrones wrapped up their shortened Season 7 last night in a way that was satisfying for most fans. Loose ends were taken care of while viewers learned new information about one of their most beloved characters that will have mighty big implications for the upcoming 8th and final season of the show. But not all fans and critics were satisfied with the way that Season 7 turned out and many have spoken quite loudly about their distaste with the hit series. Clearly, someone who works on Rick and Morty fell into the camp who was dissatisfied with the events of Game of Thrones Season 7 as they posted a clever post-credit scene in which they mourn the loss of the writing on Game of Thrones. A Twitter user named Nik posted the image of the screen to the social media platform. It simply reads: "The Writing on Game of Thrones (2011 - 2016)." The reference is in to the critics and fans who have criticized the show for trying to cram too much information into such a short amount of time. Many have criticized Game of Thrones' writing ever since it outpaced the novels of creator George R.R. Martin, many saying that the show left the story as background to show off powerful new technology to bulk up certain scenes. The show lost a certain nuance that it had when it started out and many fans began to take notice. Things got even more out of hand for the seventh season when the writers seemed to disregard timelines and were forced to push the show through as fast as they could. In other Rick and Morty news, popular toy company Funko has revealed its "Pickle Rick" Pop! Figure to coincide with the currently running third season of the Adult Swim cult classic. One of the standout episodes of the third season has been the third installment in which Rick turns himself into a pickle to avoid going to family group therapy. The Pop! figure of "Pickle Rick" will be available in two different figures, one normal "Pickle Rick" and then a separate "Pickle Rick" with lasers, both of which will be available in December, presumably to cash-in on the Christmas shopping rage. While Rick and Morty obviously weren't happy with Season 7 of Game of Thrones, many fans were pleasantly surprised by the events in the season finale last night. Rick and Morty is currently in its third season, so we'll just have to wait and see how well they fare when season seven rolls around. In the meantime, check out the Rick and Morty's commentary on the writing of Game of Thrones and the "Pickle Rick" Pop! figure below.